Good issue for me. Like the SNK feature, dont mind the 'advert' style book you get with it, mags nowadays need to make money. Eidolon was a game i never got into back in the past, i'll be interested to give that another go. NARC is a classic. Loved the GBC back then so interested in that. Not a fan of the Lynx i'm afraid so not fussed about that article. Getaway was a good game, like the small features on StarQuake/+3 so a good issue for myself. Like the 'dual' cover of the subscription mag as i'm not a fan of that SNK subscriber cover - way too plain. Yeah the subs cover is actually the worst so far, and I'm not generally fussed by the covers - so good to have two of them for this issue. Eidolon was excellent and loved it on the A8 (also very good C64 version). Lynx Gauntlet 3 article is, in my opinion not a particularly good effort and should have been researched a little more, so worth skipping that. The Lynx was a great system though and there are some excellent games worth giving a go (just avoid Gauntlet 3 unless you want some banging headaches)! 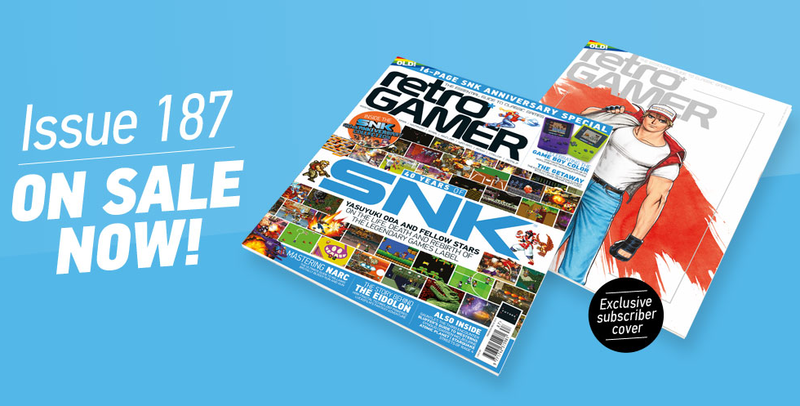 LOADS of SNK stuff to read - the NEO GEO was awesome so looking forward to going through that. Please elaborate. What part was badly researched exactly? The Lynx was a great system though and there are some excellent games worth giving a go (just avoid Gauntlet 3 unless you want some banging headaches)! A nothing issue for me but I do like these little booklets you are including with the magazines and hope they continue. Ah, didn't see that you'd done the article The Laird. Have they only just changed the articles to include 'words by whoever'? Maybe not poorly researched, more a case of maybe better to get the 'making of' from more than one source? Lynx Gauntlet III does seem to highlight the dangers of only using 1 source as a reference. Jon's personal accounts made for some great reading, but aspects of explaining why the game has to be played sideways, don't tie in with accounts from other Epyx staff: e.g. development before we had hardware to test it on. We tried one game as a vertically based game as an experiment. We wanted to know what kind of features in the system we could take advantage of. Many things in the hardware design were changed because of the games that were being written for the system. By the time we knew that playing Gauntlet vertically would not be a good idea, it was "too late" to change the orientation to horizontal. All of the excuses in the world don't make the game any better for the consumer, but this is what happened." Stephen's account makes it look more like a bold experiment that was left in by accident and only stayed because they didn't have the time to fix it before final release. Also..whilst the more favourable review scores from the UK Press were mentioned, i noticed the IGN (55) and EGM (70) scores were curiously absent. The inventory system of the game was a nightmare. Whilst the game allowed you to skip 5 levels at a time, upto level 20..level 21 had so many treasure chests you soon filled up your limited inventory and had to spend time finding areas to drop items off 1 by 1...which soon got tedious. The games SP mode lacked the drama of the real Gauntlet games., creature A.I simply waited for you to trigger their attack zones and charged the player. It's easily one of the weakest games to bear the Gauntlet name. The sideways view in Lynx Gauntlet 3 gave people headaches after playing for long periods...Lots of bright colours used caused eye strain. Since levels are presented in a fixed order, and the location of their contents never change, the game becomes static and predictable. Progress can often be made by doing nothing more than standing still and holding down the attack button, which kills any need for strategy and increases the repetitive atmosphere of the game. The book-throwing nerd and the guitar-throwing punk rocker are essentially useless. (although you mention this in the boxout) only the more balanced avatars like the "Samurai" or the laser-shooting "Android" are really worth using. It's little more than a solid arcade adventure type game, which Atari slapped the Gauntlet name on to add market value to. I know some of the above was covered in your article and it was an ok read - maybe I'm just being picky thinking a 'making of' should be maybe more than one member of a team? Bah! I'll just stop being so fussy I think. Is that you Rogue Trooper? I actually had interviews with two of the people who worked on it creator/designer/lead programmer Jon Leupp and co-programner/level designer Chuck Somerville. But Chuck's memories were much the same as Jon's only less detailed, so decided to just focus on Jon. I would be inclined to believe Jon over Stephen, especially as Jon explained the release was delayed quite a bit (was meant to be a launch game) to make some changes to the game to turn it I to Gauntlet. They could have easily changed the aspect then if they had wanted to. The way Jon explained it to me the vertical play was decided and set in stone very early on and Atari were keen to have a vertical game in the line up too. Who in god's name is rogue trooper?